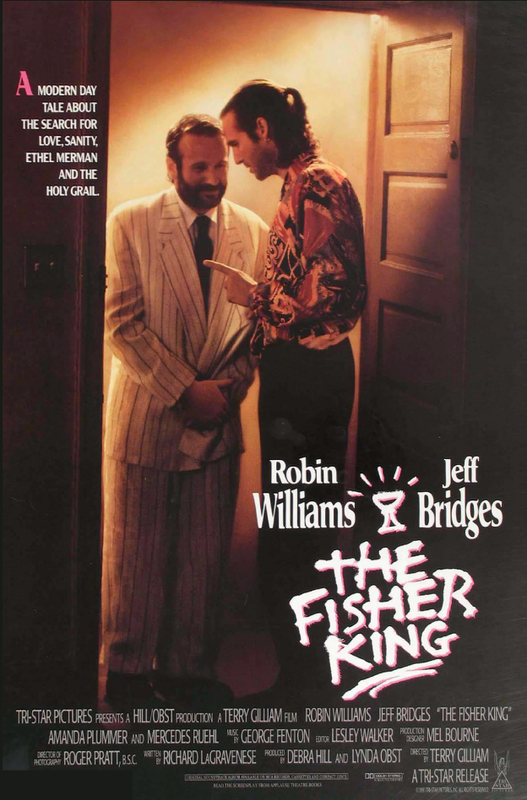 The Fisher King is an interesting case in some ways. It’s a good film, but one that could have been great if it had managed to be more focused on the parts that work. But said parts might not be the ones you’d expect from its director Terry Gilliam. In most of his other films, it’s his sense for either absurd humor (anything Monty Python-related), wild imagination (The Adventures of Baron Munchausen, The Imaginarium of Doctor Parnassus) or the blurring between reality and delusion (Twelve Monkeys, Fear and Loathing in Las Vegas) that stand out as something special. 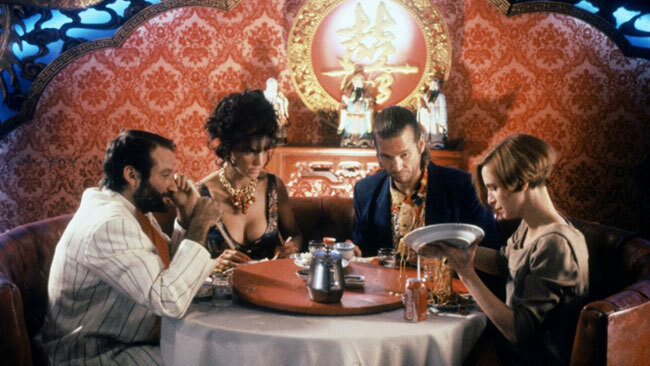 In The Fisher King, I find myself wishing he’d scale back on all those things and instead allow the relationships between the characters to take more room. As the film opens, we’re acquainted with radio shock jock Jack Lucas (Jeff Bridges), a sccuseful man ready to take the next step in his career and start pursuing acting. He’s at the top of his world when disaster strikes: after giving particularly insensitive advice to a caller on his show, said caller snaps and goes on a shooting spree in a restaurant. Many people die and Jack’s career comes to a screeching halt. Flash forward three years and Jack is now a suicidal depressive stuck working at a video rental store, plagued with guilt over his part in the shooting. A chance late-night encounter with the bum Parry (Robin Williams) offers what might be a chance at redemption. Parry is clearly crazy, conversing with imaginary little people and on a quest to find the holy grail somewhere in New York. At first Jack wants nothing to do with the nut-case, but when Jack realizes that Parry’s wife was one of the people killed in the restaurant, he begins feeling responsible. He needs to help Parry in any way he can. The quest for the grail is not the only thing Parry needs aid with, though. He has also fallen in love with an accountant named Lydia (Amanda Plummer), whom he observes from afar but never dares to approach. This too Jack needs to do something about. The Parry character is what drags the film down. It’s not that he’s dull (because he isn’t) or that Robin Williams isn’t good in the part (because he is), but he takes upp too much space. He takes his clothes off and watches the stars in Central Park. He’s chased by a monstrous red knight of his delusions. He conducts fellow homeless in singing songs. Not to mention the ever-present search for the grail, supposedly to be found in a rich man’s home on Upper West Side. All these things feel like distractions, only indirectly connected to Jack’s problems and, worse yet, not even fun. Whenever the film indulges in them, it slows down and loses my interest. This makes in particular the first half of the film drag a bit. But when the film takes a step away from these things and focuses on the relationships present, it really shines. The Lydia of Parry’s desires is in the film described as mousy, and that seems accurate. She has her own hang-ups and quirks and appears a better match for Parry than what he’s probably aware of himself. The best part of their courtship is a quite touching scene in which Parry, after an arranged double-date at a Chinese restaurant, professes his love for her (capped off by a really funny closing line by Williams). Very sweet. Even better is what’s going on between Jack and his boss/flatmate/girlfriend Anne (Mercedes Ruehl), the other half of said double-date. Their relationship is a complex one, based as much on need as on affection. The Fisher King is never better than when it pairs off these two characters alone to have them talk about what’s going on between them. It works because they have believable issues and we can sympathise with both of them fully. This kind of thing has never really been Gilliam’s forte, so it’s a pleasant surprise that these scenes are as good as they are. No, not good. Great. Credit to both Gilliam, the actors (Ruehl in particular) and writer Richard LaGravenese for making these scenes so special and heartfelt. But for every scene of such greatness, there’s another sidetrack to Parry’s craziness and I find myself gritting my teeth and trying to invest myself in the going-ons of his delusions. At one part, right after Parry makes a breakthrough with Lydia and they part ways, the red knight shows up to haunt him again. Having for once broken out of his craziness and behaved mostly normal for some time, he now falls to his knees on the street and cries out “Please, let me have this!”. I share the same sentiment. Let him be normal! Despite the missteps this film makes, I have to call it a satisfying experience overall, if also a frustrating one. The parts that work really work and are truly top-notch stuff, among the best Gilliam has ever directed. There is a sardonic humor running throughout the script that I quite enjoy, and not all of the crazy Parry episodes are bad (there’s one whimsical scene where people start dancing in Grand Central Station that is both out-of-place and quite beautiful in a way). The performances are also good/great, with Bridges and Ruehl carrying the dramatic load and a memorable Michael Jeter providing solid comic relief as a homeless drag queen. 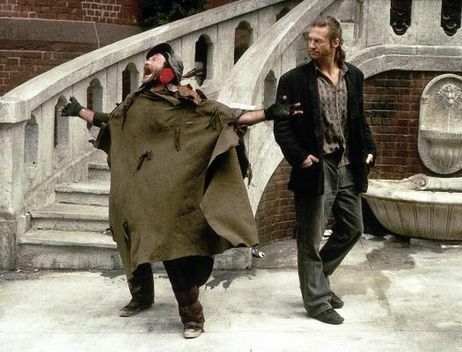 So yes, as I said in the opening paragraph: The Fisher King is a good movie. But it could have been great, and it’s a real shame that it isn’t.